A £2-MILLION investment has swung into Immingham, as the fleet of cranes that keep it the busiest freight port in the country is expanded. 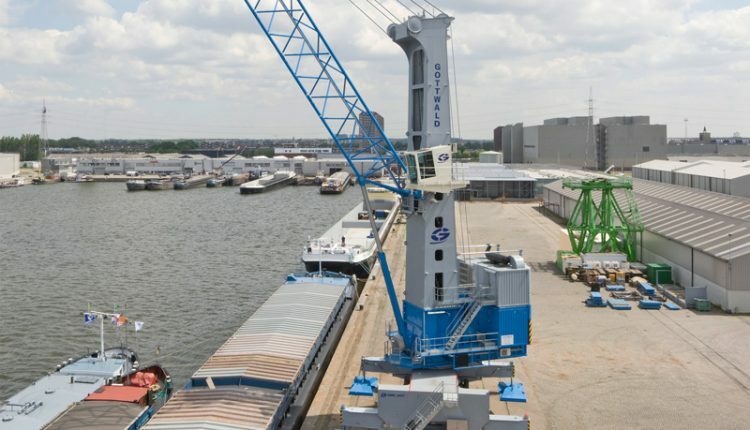 A new machine, itself shipped over direct from the Gottwald factory in Dusseldorf, Germany, will be put to use on a wide variety of cargoes. For the technically-minded, it is a Terex / Gottwald HMK 170 EG, measuring 50 metres high, and weighing approximately 280 tonnes. It took four days to reach Immingham by sea and has now joined the rest of the port fleet of 18 machines, with an estimated value of around £50-million. “It’s essential that we make efforts to continually improve efficiency in order to ensure our operations and those of our customers remain competitive and that Immingham is allowed to develop and grow,” said Mr Sellers. Immingham is the UK’s busiest port by tonnage, with 62.6-million tonnes handled in 2013. Along with the three other Humber ports, it contributes around £1.5-billion to the regional economy and supports 14,000 jobs in the area. The new crane comes as Grimsby Institute leads a project to establish a £7.8-million Logistics Centre in Immingham, to ensure the skills are there for the growth in port-based industries. Part of the plan, as reported last month, are high-tech crane simulators.